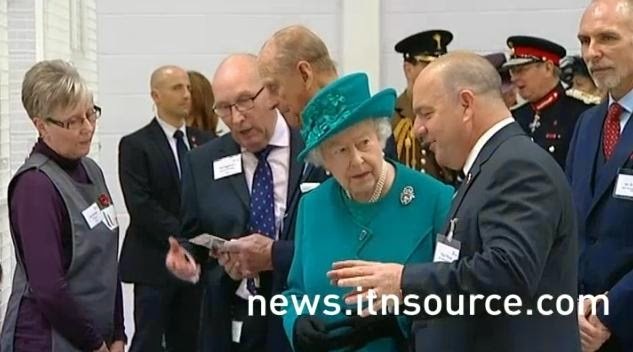 The Queen and The Duke of Edinburgh visited a stamp factory and opened a new Jaguar Land Rover factory during a visit to Wolverhampton, West Midlands. For more: Pictures from the Daily Mail, Zimbio gallery 1, Zimbio gallery 2, ITNSource video 1, ITNSource video 2. This outfit makes an interesting color pairing for Her Maj, since the brooch has red in it, but it's always nice to see a better glimpse of the Tudor Rose. It's a mystery brooch that first appeared in 2012.